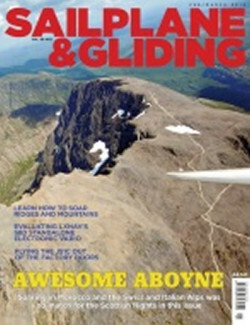 Want to learn how to soar ridges and mountains, or discover why flights from Aboyne are awesome? You can find the answers in the Feb/March issue of S&G, which also includes evaluations of Pipistrel’s Apis/Bee, Jonker Sailplanes’ JS1C and LXNAV’s S80 standalone electronic vario. If you are a flatlands pilot, eager to experience ridge and mountain soaring for yourself, don’t miss the first part in our Ask the Coach feature, Learn to soar ridges and mountains. Tony Cronshaw gets top tips from leading coach Bernard Eckey and the Scottish Gliding Centre’s Deputy CFI Neil Irving. Justin Wills and Nick Gaunt both experienced outstanding flights from Aboyne during a summer that Justin says will be long remembered for its consistent soaring conditions in the UK. He rated his ‘Highland fling’ as more memorable than soaring in Morocco and the Swiss and Italian Alps earlier in the year. On another Scottish flight, this time from Feshie, Paul Myers flew to 26,446ft. A problem with his oxygen supply prevented him from a greater height gain, but it was enough to win Paul the 2014 De Havilland Trophy, awarded for maximum gain of height. LXNAV’s S80 is evaluated by Shaun Lapworth, who says that it takes standalone electronic varios to the next level. He declares the S80 ideal for the club and competition pilot without a big budget or with limited panel space. Also evaluated in this issue are Pipistrel’s Apis/Bee motor glider – now classed as a single-seat deregulated aircraft, and Jonker Sailplanes’ JS1C. Also in this issue: In another tale from Down Under, ex-London GC member Mark Dalton tackles a weighty conversation and concludes that having water on is ‘A Good Thing’ if you mean business. Saz Reed talks to twonewcomers to wave in the first round of the Junior Winter Series at Portmoak. Robbie Robertson describes how the location of Black Mountains Gliding Club, on the east side of the Black Mountains in South Wales, is ideal forproducing good east wave, even in very light conditions. Alison Randle reports from the 2014 BGA Club Management Conference. Bruce Stephenson ponders whether glass is the future of vintage. Liz Sparrow highlights the results of surveys run by the BGA Comps Committee. Hugh Woodsend provides the latest Airprox Update, with the lessons that can be learnt. Greek gliding club Edessa reports on the EU funding helping them to promote gliding. Plus there are many more of your stunning images in the Gallery pages. SSDR – to Bee, or not to Bee? So what makes a great comp?